The second step is proof collection where you keep collecting evidence to proof that belief true. A person yawning while you talk, a friend not calling back and an unexplained look on the face of a person you barely know can all be interpreted as proofs that show that you are boring. As the time passes you keep collecting more proofs until this belief becomes a fact of your life. But the important question i am here to ask you to today is, Are you sure that proof collection process was done right? Yes i know you saw many signs that proof your theory true but are you sure you interpreted these signs correctly? Couldn't there by any errors that happened during the process? Do you believe your perception is 100% accurate? Do you think the lines in this image are straight or crooked? 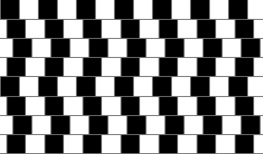 In fact they are straight but you only saw them crooked because the squares present in the image affected your perception. In other words your perception is not always constant but there are other factors that can change it. In the Solid Self confidence program i said that your beliefs, emotions, mental state and environment can all change the way you perceive things and let you see the world differently. Here is another example. 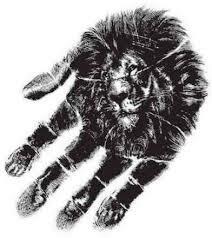 If you focused on this image and tried to see a lion you will see one lying on the ground now if you focused on seeing a palm you will see one instead of a lion.